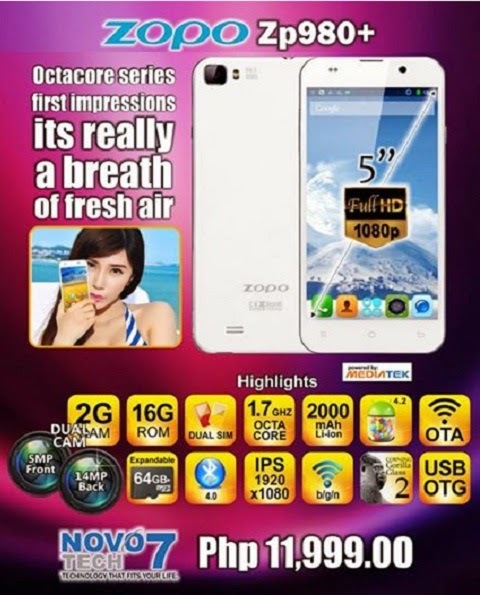 Novo7 Tech, the official distributor of THL smartphones in the country, has recently announced that the Zopo ZP980+, a 5-inch full HD display which is smaller than the ZOPO ZP988 is now available in select Novo7 Tech booths. The ZOPO ZP980+ has a 5-inch full HD display with a resolution of 1920x1080 in a 440 pixel per inch, it also has a Corning Gorilla Glass 2 protection. Powered by MediaTek MT6592 1.7GHz octa-core processor with 2GB of RAM and runs on Android 4.2(JellyBean) OS, the ZP980+ has a 16GB onboard storage that can save apps, videos and photos shot by it's 14 megapixel rear camera w/ LED flash and 5 megapixel front camera. The storage can also expand up to 64 GB via microSD slot. The ZOPO ZP980+ is now available at select Novo7 Tech stores, including SM City North EDSA, SM City Southmall, SM City Sta. Mesa, Gateway Cubao and Lucky Chinatown with a Php11,990 price tag.